He disclosed that he has been making progress on the passage of the bill, especially on the need to bring stability to the Niger Delta region. He emphasised the need to dialogue with the militants to prevent further attacks on oil installations, saying the effect is being felt by all Nigerians. Dr. Saraki also touched on issues ranging from salaries of workers and teachers in the local governments across the country to revamping the nation’s economy. The Senate President stated that teachers in the local governments should be accorded priority in the payment of salaries, wondering how structures could be built without caring for the teachers who impart knowledge. He added that the National Assembly would monitor and ensure that the executive arm of government declares all revenue accruing to the country. 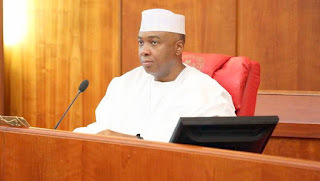 Proceeding to a private university under construction in Ilorin, the Kwara State capital in north-central Nigeria, Senator Saraki urged the citizens to be patient with the All Progressives Congress (APC)-led government. He said that the Federal Government has the ability to bring lasting solutions to the numerous problems confronting the country.